After entering by the gate into the courtyard (not into the structure of the Tabernacle yet), the first piece of furniture one encounters is the bronze altar of burnt offerings: "And thou shalt make an altar of shittim (acacia) wood, five cubits long, and five cubits broad; the altar shall be foursquare: and the height thereof shall be three cubits. And thou shalt make the horns of it upon the four corners thereof: his horns shall be of the same: and thou shalt overlay it with brass." Exodus 27:1-2. The altar was used for all the types of offerings: burnt, grain, peace, sin, and trespass. Altars are for making sacrifice, that is their only purpose. The Hebrew word for altar, mizbeach, means "slaughter place". The law declared that without the shedding of blood, there was no remission of sin. Burning the offerings on the altar had the effect of lifting them to the sky, heavenward. There are laws instituted before the foundations of the earth that must be met before mercy can be extended. Sin must be punished, either by the offender or by a suitable substitute. Five types of animals were Israel's acceptable substitutes: lamb, goat, bull, heifer, and turtle dove. Christ is our acceptable sacrifice. When someone has entered the gate, leaving behind the world, sin, and their old life, they are in the process of repenting. Repentance is not salvation, but a step on the way. The altar of sacrifice is therefore not the end of the process, but represents an end of the old life, one that is renewed in Christ, and the beginning of a new life. The four horns represented power and authority and pointed to the four corners of the earth. Animal sacrifices brought to the altar were tied to the horns because of their resistance or unwillingness to be made a sacrifice (they would likely run away from such a sight of fire and blood): "God is the Lord, which hath shewed us light: bind the sacrifice with cords, even unto the horns of the altar." Psalms 118:27. Rituals surrounded the byproducts of sacrifices made on the altar: ash and blood. The ashes were not just thrown away: "And the priest shall put on his linen garment, and his linen breeches shall he put upon his flesh, and take up the ashes which the fire hath consumed with the burnt offering on the altar, and he shall put them beside the altar. And he shall put off his garments, and put on other garments, and carry forth the ashes without the camp unto a clean place." (Leviticus 6:10-11). 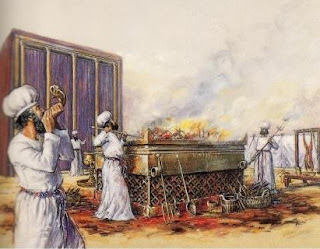 The presence of ashes indicated proof that the sacrifice was accepted, so with solemn rites, including the changing of clothing/garments, the ashes were taken to a clean place to be used at a later time in the cleansing of the ritually unclean (see Numbers 19). The analogue in Christ is that His offering was accepted by the Father, His mortal tabernacle was taken from the cross and deposited in a new tomb in which man had never lain (a clean place), from which He later arose to cleanse the sinner (the ritually unclean). Those who attend the temple will see parallels here. The blood was never used, but was poured out at the bottom of the altar. As blood represents life, the presence of blood represented further evidence that life was poured out in the sacrifice. Christ's blood was spilt for our sins, His sacrifice was accepted by the Father. The next item of furniture was the bronze laver: "Thou shalt also make a laver of brass, and his foot also of brass, to wash withal: and thou shalt put it between the tabernacle of the congregation and the altar, and thou shalt put water therein. For Aaron and his sons shall wash their hands and their feet thereat: When they go into the tabernacle of the congregation, they shall wash with water, that they die not; or when they come near to the altar to minister, to burn offering made by fire unto the Lord: So they shall wash their hands and their feet, that they die not: and it shall be a statute for ever to them, even to him and to his seed throughout their generations." Exodus 30:18-21. There is not much in the scriptures explaining the bronze laver, or brazen sea. We have no statement of its shape or size, nor is it ever mentioned when the camp of Israel packed up the Tabernacle and moved. The laver was made from the bronze mirrors of the women of Israel, which they gave as a freewill offering: "And he made the laver of brass, and the foot of it of brass, of the lookingglasses of the women assembling, which assembled at the door of the tabernacle of the congregation." Exodus 38:8. This would have been a sacrifice for these women, giving up something of worldly value to help create something of eternal importance. Perhaps this helped them focus on the work of their inner selves, their hearts, rather than spending time focusing on their outward appearances and beauty, to see themselves more as the Lord would see them, and not as they would see themselves or as others would see them. The Lord looks on the heart: "Whose adorning let it not be that outward adorning of plaiting the hair, and of wearing of gold, or of putting on of apparel; But let it be the hidden man of the heart, in that which is not corruptible, even the ornament of a meek and quiet spirit, which is in the sight of God of great price. For after this manner in the old time the holy women also, who trusted in God, adorned themselves..." (1 Peter 3:3-5). The laver stood between the altar and the Tabernacle. It was used for washing by only the priests who officiated. 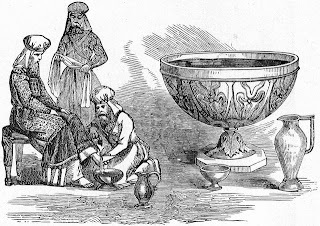 While the altar represented sacrifice for the remission of sins, the laver represented washing away of uncleanliness and purification, in other words, sanctification. The laver cleansed the priest from the defilements of life, leading to a life that was continually sanctified. The above verses from Exodus tell us that the priests had to be clean when they represented the Lord. Even one impure act could defile them and they had to return to the laver to cleanse themselves. We must be clean and pure as we seek to serve the Lord.